You probably don’t spend much time in Canberra these days, but what is the music scene like there and how does it compare to cities you visit on the road? About half of us still live in Canberra, although it wouldn’t be hard to forget sometimes with the touring stints we’ve had over the years. Honestly, Canberra doesn’t really have much of a central ‘scene’ or community around music – Canberrans certainly love good music and the city has produced some pretty rad acts (Peking Duk, Safia, etc.) but it hasn’t necessarily turned into a thriving music scene. A lot of venues have come and gone, and each time one closes, it takes a long time for that sense of community to build up again around another one. Take us back to the early days, how did Hands Like Houses form? No particularly remarkable story to tell here – just that most of us met through playing in various local bands when the local scene was thriving (largely thanks to Myspace at the time), and as different members came and went, each of us came in for someone else until we settled on the lineup we have today. Your latest album -Anon is out now, and was recorded in LA last year. Can you share some of your favourite stories from the process? We spent a lot of time bouncing around between North Hollywood and our accomodation in Los Feliz – to be honest there weren’t many specific stories or events that made it such a fun and relaxed process but the experience itself was so calm, confident and comfortable that we just had a great time and the album shows it. There was a great energy around everything that was happening. This album introduced a more rock n roll vibe to your music – a change from the heavier tracks of the past. What influenced the sound and songwriting for this album? I think we just decided to let go of how we saw ourselves and in turn, how other people saw us, and embrace the influences that we’re enjoying the most at the present moment. That was pretty much it. We never considered ourselves a heavy band, we just made some heavy music here and there, but it wasn’t the heavy stuff that we felt defined us – it was the sense of melody, dynamics and space, which really just boils down to making whatever music we’re making, into the best version of itself, and that’s going to sound more like ‘us’ than anything we could define as a specific sound or vision. What has the response been like from fans? It’s honestly been amazing – especially in a live context. There were a few expectations to be bucked early on, and as with any shift between records, there was always going to be some bitter folks who can’t let go of a specific moment in time and embrace the journey. But as far as we’re concerned, this album was no more different to our last than that album was to the one before it in turn, and so on. I think the fans that we value the most (and the ones who appreciate us the most) are the ones that have embraced each album as it’s own entity, and seen the subtle sense of character and sound that comes through the journey as a whole. You’ve had 3 massive back to back sold out Australian tours, and will be playing your biggest Australian shows to date in February. What are you most looking forward to with these upcoming shows? I think this is our first real chance to break out the big guns in terms of planning for some distinct and exciting production – between the light, sound and FX we’re planning a handful of things to make these shows particularly memorable to experience 🙂 plus we’ll playing a couple of new songs for the first time in Aus, in addition to the singles we road-tested already across Aus, UK, Europe and the US late last year. Who are some of the artists you’re listening to at the moment? Personally I’m listening to a lot of Thrice at the moment, especially their new album Palms. That said I’ve actually been a bit slack in listening to music in general – I tend to take sporadic breaks away from music as purely a listener. Between the band and my own writing and production work out of my studio, it’s hard to just kick back and enjoy something without my ‘work’ brain kicking in and breaking down the mix, the production and the writing etc. I do tend to appreciate things I enjoy more for that breaking down, but it’s harder to just put music on casually without actively listening, which isn’t always what my brain wants to do haha. What does the band like to do away from music? What does Hands Like Houses have planned for 2019? We have a pretty busy touring schedule through the front half of the year between Australia, South Africa, the US, UK and Europe, but we’re quietly hopeful that there’s a little more breathing room towards the end, to rest, recover and maybe even start putting together a couple of new tunes haha! It’s gonna be a big year, capitalising on everything we poured into last year and keeping the momentum going – and hopefully growing! That’s a tough one, I reckon as a band, Capital Brewing/Brodburger at Fyshwick is one of our favourites to chill and have a brew and burger, especially after a long day of band practice around the corner. We’ve actually had an acoustic show there recently and that was awesome – we set up in front of the beer vats and it was a special night with friends, family and fans alike. Great beer and burger selection too. 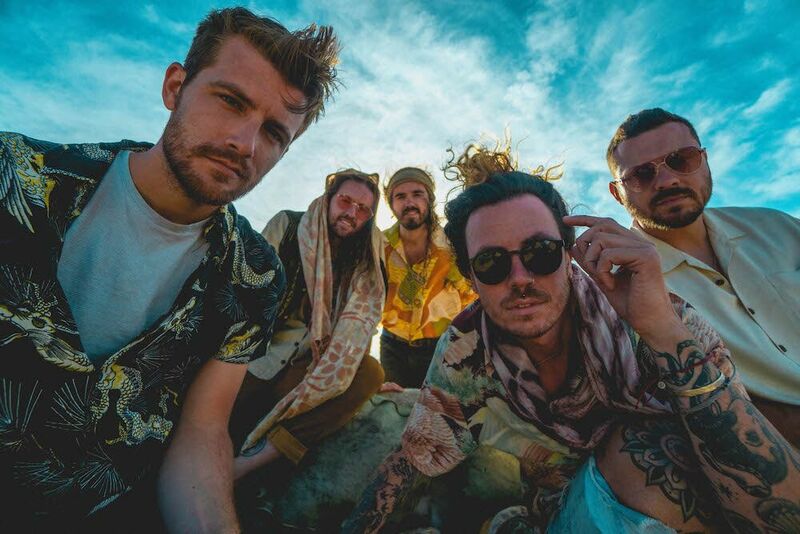 Hands Like Houses are touring nationally in February, in support of their acclaimed album -Anon.